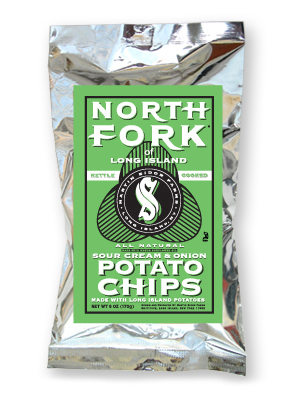 North Fork have gone against the grain with their packaging. Rather than taking the 'If you can't beat them..." route, they have developed an original concept, for which they should be greatly praised. The silver bags look like they contain fresh food. The bold and bright colour coded labels make them easy to spot on shelves. Best of all for the company, is that compared to other options, this would almost certainly have kept costs down. These were a really crunchy Chip. The Kettle Cooking, combined with the brittle, snappy qualities, made for a real mouthful of noise. These Kettle Cooked Chips appeared a little thinner than many of this nature. There were lots of irregularly shaped Chips with some bent double. There was minimal skin visible on edges, but there was a hue to them that made them look fresh and crispy. 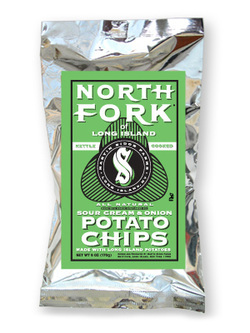 North Fork have managed to create a really interesting flavor. It says Sour Cream & Onion on the label, but if you were to walk into a countryside farm shop and purchase one of those lovely little hexagonal jars with a dressed up fabric jar lid and 'Home-made Chutney' hand written on the label, you would find a flavor that you would not associate with anything you might find on a supermarket shelf. These Chips were a little bit Sour Cream and a little bit Onion, but mostly, they had their own unique flavor that oozed home-made charm.